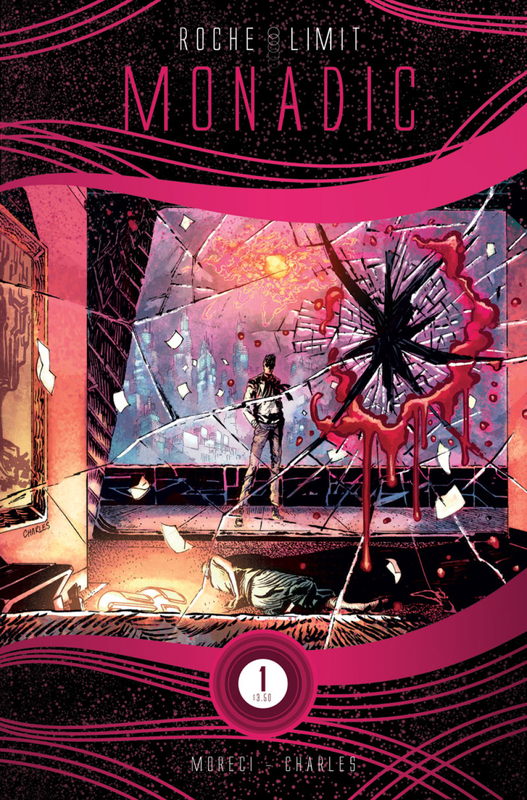 As Roche Limit: Monadic #1 kicks off the final chapter of the contemplative odyssey that includes the Roche Limit opening series and sequel Roche Limit: Clandestiny, writer Michael Moreci readily admits that his “brain-candy sci-fi” comic isn’t exactly typical. Featuring art by Kyle Charles, Monadic is a stellar-noir saga of aliens and existential doom, but so often it’s hard to tell if it’s simply science fiction slathered in metaphysics or a philosophical allegory with spaceships. 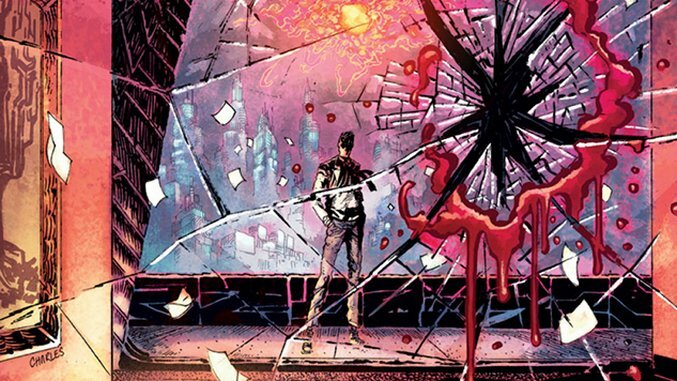 Held up against some of its more digestible genre contemporaries—thought-provoking gems like Black Science or Descender —Roche Limit is… Well, it’s kind of weird. The comic doesn’t so much provoke your thoughts as much as it demands them. Profound ones, in fact. 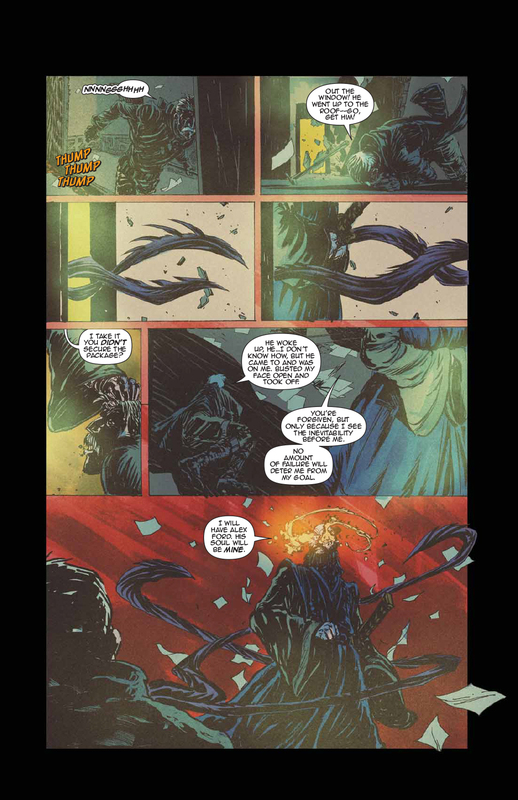 At this comic’s bedrock lie some of our heaviest philosophical questions concerning souls, consciousness, the hereafter and our place in the universe, and it leaves those questions unsettlingly, if unsurprisingly, unanswered. Throughout the series, Moreci and artists Vic Malhotra, Matt Battaglia and Charles present a world of missed opportunity. Langford Skaargred, an idealistic billionaire, poured his fortune into the creation of a deep-space colony on the edge of an anomaly that (unbeknownst to anyone) separates those who enter it from their souls. The Roche Limit colony, as Langford dreamed, would be a path to unparalleled discoveries, a way station from which humanity can splay its tendrils throughout the universe. 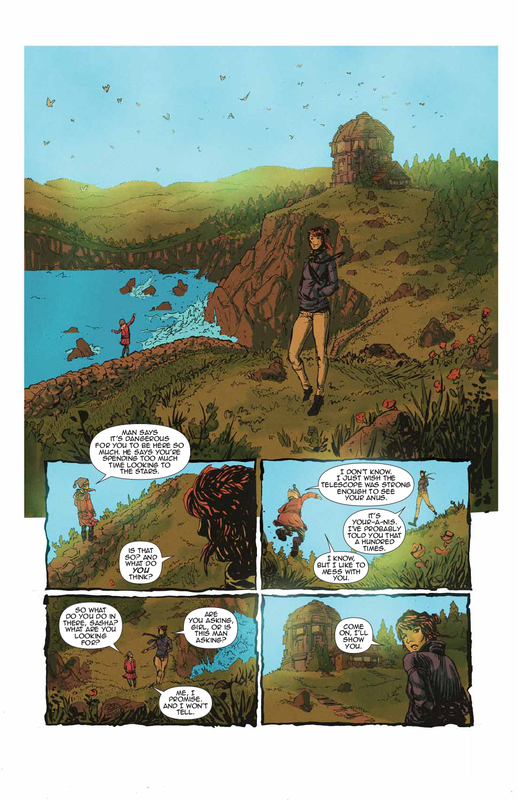 But ultimately, Roche Limit’s noble intentions give way to vice and iniquity. A nihilistic cult, led by the fearsome head of the colony’s underworld, clears the way for soul-seeking aliens to enter through the anomaly. Eventually we learn, however, these aliens mean not to eradicate mankind but to co-opt it; not to destroy humanity but to become human. But what exactly does that mean? Moreci took some time to tackle some of those big questions, elaborate on his philosophical vision and explain why Roche Limit is not the despairingly pessimistic book it appears to be at first glance. Paste: If you were going to nail down a philosophical core for the series, what would it be? Michael Moreci: One of the core components we’re dealing with is the human soul, so it’s meant to be a very personal and intimate philosophy about your own life. The idea is, to build a better world you have to make your world better. All of these characters are guilty of their reach exceeding their grasp. In the process of doing too much they lose so much: Langford lost his humanity, Sasha loses her family. So the message, for me, is to cultivate your own spirituality and sense of self, and if you build out from there, if everyone did that, we would see a collective better world. Paste: That seems like something mankind would probably fail at. Langford is an idealist who makes this awesome space colony, but it ends up full of crime and drugs, which seems like exactly what we’d do. Moreci: We all have grand ambitions. You see these futuristic space movies where we’ve made technological leaps and the world is better. Technology is not going to make the world better because anywhere we go, we are going to take our problems with us. No matter what you do, if you never rectify what’s going on at that rotting core, it’s not going to solve your problems. It’s like you said, we go to this colony and Langford has this great ambition, and it’s noble, but we just took our problems from one place and brought them to another. Paste: There are a lot of themes on humanity, and they’re not always positive. Humans are often depicted as either inherently bad and destined to ruin everything or as wonderful, unique creatures. Where does Roche Limit fall on that spectrum? Moreci: I think it’s somewhere in-between. I’ve had to catch myself a few times because I don’t want to come off as being deeply cynical, which sometimes the book conveys. We have the capacity to do great things, and you see it in selflessness and philanthropy, and the overall interactions of love, generosity and kindness. But also terrible things, very, very terrible things. I don’t know if there’s ever a way to balance that scale. Paste: Are humans capable of not ruining everything? Moreci: Personally, probably not. I’d like to say, “Yeah, we can do it.” Look at our country, and you see the way power is structured, the way money is structured, the way it’s consolidated. That has been the human tendency forever, consolidation of power, whether it’s economically, militarily or through government, humans are always craving power. As long as you have that, I don’t know how you can have a harmonious society where we’re all working together. To get to that place we have to all be pulling in the same direction. Paste: If making a better world starts with making ourselves better, that idea seems like one people may still somehow translate to greed. Moreci: I agree. There’s the two sides of the coin. One side is if you can’t beat them, join them and have a craven desire to get to that place because we celebrate it so much in our culture. Or you fall into the other side of selfishness—crime, abusive behavior, whatever—because you become very nihilistic. Paste: Nihilism actually plays a large role in the story, too—it’s personified by Moscow, the colony’s crime boss. Why did that idea get so much weight? Moreci: It was important to show the other side. Alex is maybe not as conscious of a nihilist, but he’s a purveyor of this drug that’s so destructive to people. So I wanted to show what a real nihilist is, what Alex is working against. Langford is the exact opposite—while he’s misguided, he was never all about himself. Paste: A lot of classic sci-fi has a message, like Cold War-era stuff preaching humanity’s impending doom. What would you say the message here is? Moreci: The stuff that inspired Roche Limit was Blade Runner, Gattaca, Dark City, The Foundation Trilogy from Asimov. 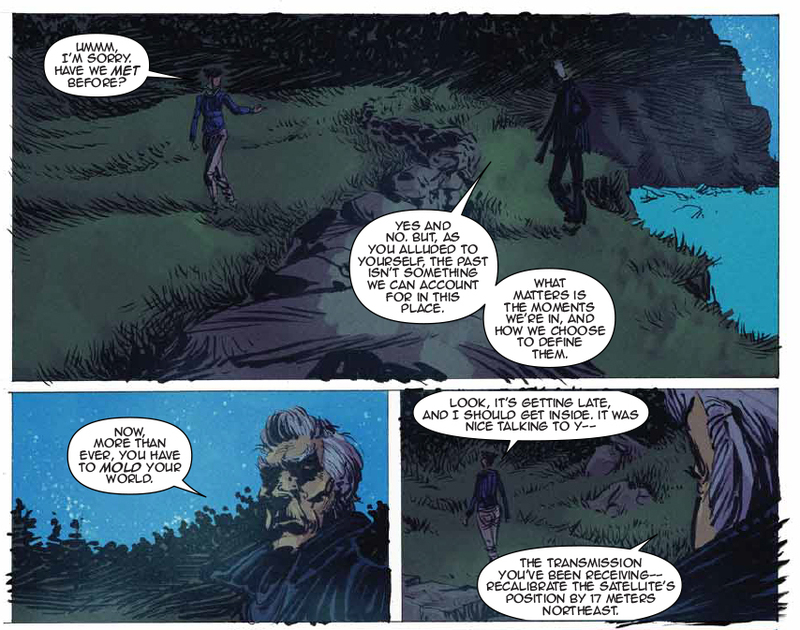 I think that the message of Roche Limit is about the idea of the soul and cultivating your world. It has been cynical at times, because I’m cynical at times, but I think ultimately the message is life-affirming. I’m not a very religious person but I am spiritual; I believe we have something akin to a soul and that it is something to cherish and value. And what that means for us, what our capacity is, is special—what we can do in terms of evolving, in terms of going to great places and seeing new things. The world we can build can be very special and unique, because each of us is very special and unique. Paste: Was it a tough sell to pitch a story that hinged so much on questions of the soul? Moreci: Yeah, it’s funny, I just did a con and people were like, “What’s this about?” and there’s just no elevator pitch. It was a tough sell and I think that’s the great thing about Image. It’s a challenging book, and I know it’s a challenging book, but we managed to carve out this cult readership. Paste: Why did you opt for a three-part structure with big time gaps, and did you see any drawbacks to that? Moreci: Well, it was a great idea at first. As soon as I finished “Anomalous” and started “Clandestiny,” I realized, Oh god, I have to start from scratch. But it was cool. The challenge really reinvigorated me once I came to terms with it. Paste: Humanity plays a big role in Roche Limit. What does it mean to be human? Moreci: I think we’re defined by a lot of things. We’re defined by the way that we love and what we do with that love. We’re defined by our vision and how we execute our vision. It could be to be a great family man or woman—that’s a noble vision. That sense of purpose is really what makes us human. Conscious choices, moralism—we can have these kinds of discussions because we’re these higher-evolved sentient beings and we understand what choices mean. Paste: Since the soul plays so heavily into the story—the aliens consuming them to be more like us—what would you say it is exactly? Moreci: It could be consciousness. It could be a spiritual unit of being. The third title is “Monadic,” and according to Leibniz, a monad is a unit of being. It’s hard to define, but it’s this thing that makes us unique and that plays against the aliens who are a hive. One of the big threads of the story is that the aliens are not trying to obliterate humanity—they want to become human, because of our individuality. We are all special in some way and it’s because we have a consciousness or a soul. What happens to that quality when our life is over? Does it go to an afterlife? Does it go to a new body? Does it just join the universe? To me that is what the soul is: something that makes us human and potentially carries on through time and space and who knows where. Paste: You present a spectrum of different perspectives on humanity—androids, two different versions of Langford, aliens who strive for it—can you unpack those different layers? Moreci: On one end you have humans with souls, and on the flip side you have aliens who want this quality. In between is something like Danny, who is an android, who we assume doesn’t have a soul because he was manufactured, but he understands. There’s a moment where he says something like, “I may not know the feeling of love, but I know about being loyal and living for someone else.” That thing that the aliens want that we have, can that be learned? He made a lot of decisions to shape his world. When he was exiled he could have gone a very different way and he didn’t. He’s a robot who’s decided to be better than what he’s considered to be. Paste: How do the aliens intend to become human? Moreci: I wanted to kind of deconstruct the alien invasion story. I wanted it to be something other than “they’re just here and they want to destroy Earth.” The thing that they need to learn is it’s not just about absorbing our individuality, it’s about understanding what makes us human. The thing that’s holding them up is the idea of sacrifice. They have a failure comprehending why you would give up your survival, why would you negate that for any reason ever. That’s like the last hurdle. It’s like there’s an error in the coding: survive at all costs, but give up your life if you need to. I think that’s one of the noblest things we are capable of. Paste: Clearly, I read this with a pretty pessimistic take on humanity. Is there going to be some sort of be-careful-what-you-wish-for element, like aliens want to become human, but guess what, humans are terrible? Moreci: No, but that would have been awesome. If I wasn’t going for the life-affirming message, that would be the ultimate ending. Paste: Just like, aliens eating too much fried food and yelling at each other, storming Wal-Mart on Black Friday. Moreci: Yeah, volume four can be a hundred years in the future when they’re all overweight and can’t get anything done. And they’re all miserable and just don’t want to admit it. Paste: So, what can we expect from “Monadic”? Moreci: My main goal was really to give a satisfying ending. The end I’ve had in mind since the beginning… I haven’t known every step to get to that ending, necessarily. The characters come full circle, the themes come full circle and I wanted to clarify everything that came before. It’s an unconventional book in a lot of ways. I’m glad people took a chance on it and I want people who take that chance to feel rewarded. Paste: And thematically, what’s on the horizon? Moreci: Believing there’s something bigger and allowing yourself to be part of something bigger. And that something bigger can be your family, a higher being, it can be anything, but the point is that you are able to surrender yourself to something bigger. I think that’s the final point of Roche Limit, cultivating your world, making yourself and those around you better, but also realizing you’re part of a bigger whole. Ultimately, whatever you have is going to end, that’s just the way of life. But the next step is to be absorbed somehow into something that’s beyond you, that’s bigger than you.